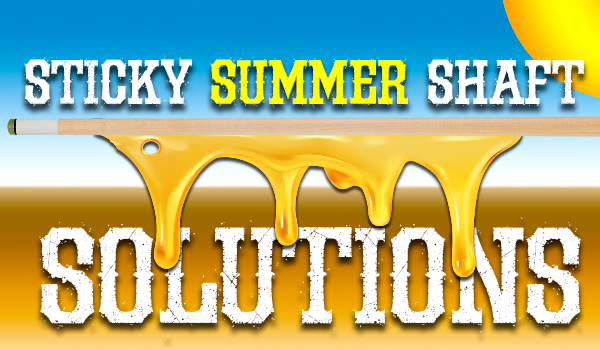 Sticky Summer Shaft Solutions - What did I just say?! Okay, let's get this out of the way upfront: there's no way to talk about reducing the friction on your cue that comes with the hot and humid weather without sounding like a total pervo. Your high school health teacher was right, though, just because something's difficult to discuss doesn't mean that we can avoid talking about it. 1. Clean your shaft. No matter how clean and dry your hands are, if your shaft is coated with dirt, oil and chalk, the contact is always going to feel gritty and unsatisfying. There are many shaft cleaners on the market, but I use a little powered bleach cleanser on a damp paper towel to get the job done. There's some abrasiveness to slough off the layers of filth and the bleach does a nifty job of lifting out chalk stains. Remove the excess with a clean, damp paper towel. A sticky shaft can mess with your head during a match! Take preemptive measures to maintain a consistent stroke and you'll have one less thing to worry about. 3. Bring a towel. One of the most frustrating things as a player is when you're forced to dry your freshly-washed hands with a low-powered air dryer. Even though they're terrible for the environment, paper towels are a pool player's friend. To be totally prepared, you can always bring your own towel to make sure that your hands are dry enough not to stick to your cue. Much like golf, you can get one that hooks handily to your case. 4. Use talcum powder, extremely sparingly. This option gets a bad name because many players abuse their powder privileges by chalking up like they're at a gymnastics meet. The rule of thumb is that you should never leave any trace of powder on the felt after you shoot. The best way to ensure this is to apply a tiny bit of talc to your shaft with your hand, then wipe your hand before you approach the table. You can carry a little bottle of baby powder in your case or get a special fabric bag that's filled with talc and distributes just a little at a time. 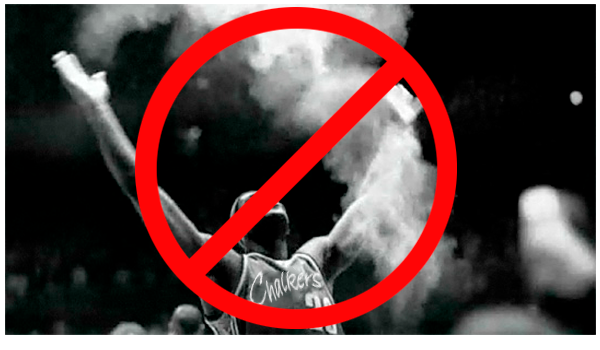 Don't be that guy who gets talcum powder (cone chalk) all over the place during a game! Use talc sparingly or try one of Liz's other suggestions. 5. Wear a glove. If you want to bite the bullet permanently and set up the most consistent conditions for yourself, you can join the legion of dorky players who wear a glove. I, myself, am a self-hating, card-carrying member. Once you get over the shame, it's hard to imagine ever going back to the days of bare skin. No glove, no love!